A dying man’s report of a ritual black mass stirs Britain’s security chief into action, and a mansion filled with young vampire girls is soon discovered. And this is but the first twist in a labyrinth of horror. Peter Cushing and Christopher Lee pair up for the final Hammer Dracula in this follow-up to Dracula A.D. 1972. In this go-round, the Count (Christopher Lee, naturally) follows a more pulpish, super-villainous playbook, posing as a millionaire industrialist alive and well and living in London while secretly brewing up a batch of super-plague in a quest to destroy the world. Mixing Satanists, spies and sci-fi, the film makes viewers glad that Peter Cushing is on hand to solidly anchor the more outer elements as the effortlessly expositioning Dr. Van Helsing. Lee, in turn, has more dialogue as Dracula than was the norm, and rachets up the evil to the tenth degree. Joanna Lumley (Absolutely Fabulous) costars. Also known as Count Dracula and His Vampire Bride. 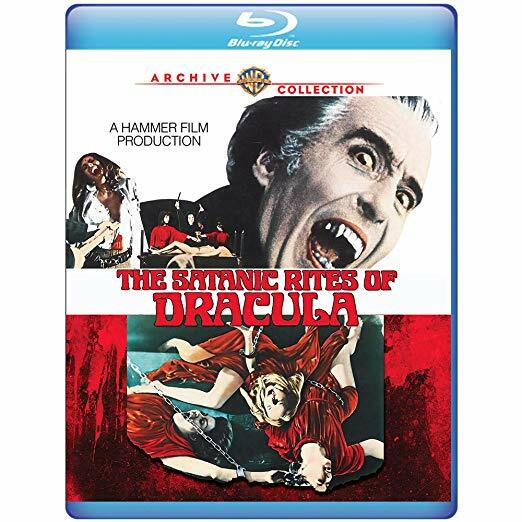 Once more its nice to see another Hammer Film make its way to blu-ray through the Warner Archive collection. Here we have a brand new 2018 master and the film looks better than ever! THE SATANIC RITES OF DRACULA has a DTS HD Master Audio Track and as well as the English 2.0 Mono track. For this film in particular it suits it quite fine. The Video transfer looks great, with very few minor complaints within reason. A terrific release. Sony Pictures is releasing Francis Ford Coppola's DRACULA this October!